When people discuss Colorado Springs, it’s likely they think of either Pikes Peak (America’s Mountain) or Garden of the Gods (a spectacular red rock laced city park). And, we’re proud of that fact, but did you know that we have great places to shop, dine and experience culture? In this blog post, I’m going to talk a little about the history of our neighborhood and the area we now know as “Old Colorado City”. In 1985, when we looked for a place to hang our shingle, way back in the “olden days” of our hunt for the perfect B&B location, we settled on the historic Westside. During that time, the historic district was just getting started as an up and coming shopping area. We felt it was the perfect location for a young couple looking to make their Victorian B&B dream a reality. And, we look back today and know it was definitely the right choice. lier 1800’s version, but Holden House’ close proximity to amazing shopping and dining experiences is the perfect location to enjoy a stroll during winter, spring, summer or fall in the historic district. Some of our favorite businesses include unique specialty and jewelry shops, quaint coffee houses and wine bars, varied food selections and local art galleries. 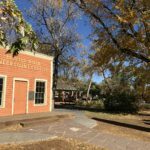 Within the historic district during the summer, the weekly Farmer’s Market takes place and the Old Colorado City History Center is located in an historic church building with a colorful past of its own, featuring a museum and gift shop. As we’ve seen our neighborhood transform over the years, the organic growth of new businesses along the West Colorado corridor are now developing to the east, with great brewpubs that are easy walking distance to the inn including Cerberus, and N-3 Taphouse which is located in the historic and original Fire Station Number 3. 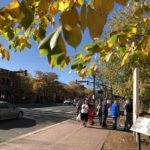 A Star Struck Neighborhood: And just a few years ago, our neighborhood block became the center of attention when actors Robert Redford and Jane Fonda starred in the film “Our Souls at Night”, now available on Netflix. It was to the delight of our guests (and us) to have film-star neighbors for a short time. In fact, our neighborhood has been used for several movies including the movie with Walter Matthau and Harry Morgan titled The Incident which was released in 1990 and filmed just a few blocks to the west on Pikes Peak Avenue. 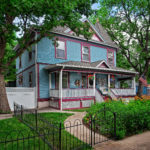 Whatever your interests, we invite you to explore our historic neighborhood and enjoy our restored Victorians anytime of the year with a visit to Holden House 1902 Bed & Breakfast Inn. This entry was posted in blog, Colorado bed and breakfast inn, colorado city, Holden House 1902 Bed and Breakfast Inn, Holden House Bed Breakfast, old colorado city, Old Colorado City historic district and tagged Cerberus, colorado springs, Garden of the Gods, history, holden house, N3 Taphouse, Netflix, old colorado city, Old Colorado City History Center, Our Souls at Night, pikes peak, Wikipedia by admin. Bookmark the permalink.